“I enjoy a good workout on a smelly, dirty yoga mat,” said no one ever. It’s kind of funny to think of someone actually saying that but the truth is that it really is important to keep your yoga mat clean. Regular practitioners know the amount of sweat and dirt that can otherwise build up, not to mention the germs. Let’s admit it – it’s also pleasing to the psyche to workout with sanitary equipment. 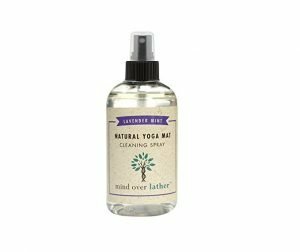 Mind Over Lather’s yoga mat cleaning spray is one product that is a must-have. Give your mat a few sprays after your workout and wipe it down. It’s just that easy. The spray comes in an 8-ounce bottle with a lid to keep it leak free. Store a bottle in your bag or locker without taking up much room at all. Anyone who is concerned about chemicals and other toxins that are usually found in similar cleaners will love this spray. It is completely natural and made with essential oils including eucalyptus and tea tree. There is no alcohol in it either so you never have to worry about drying out your mat. Another point worth noting is that the essential oils used in the spray are antiviral. The fresh scent of the spray is another added bonus. When you spray it on your mat you will immediately notice the calming and relaxing scent. The fragrant aroma is inviting without being overpowering. One pet peeve that many of us have when it comes to less effective cleaning products is how they only mask odors without eliminating them. That is one problem that you will never have to contend with when you use this spray. It’s powerful enough to eliminate those not so pleasant smells while working to freshen up your mat. Usage of this product is not limited to only your mat. Many customers use it to clean counters, freshen up shoes, cushions, bedding, etc, to eliminate pet odors, and use it as a bathroom spray. Keep a bottle in your car as well, especially if you are planning any long trips with anxious pets. Giving their bedding and blankets a spray means the soothing and relaxing scent will calm any unease they might feel. With so many versatile ways to use this spray and the fact that it’s completely natural makes this a winning product for every consumer. Not only will you have a clean yoga mat but you’ll know that you got your money’s worth every time you use it.